Though organs are mostly associated with church music the positive organ was a smaller version, most often used in domestic settings in the 16th and 17th centuries. 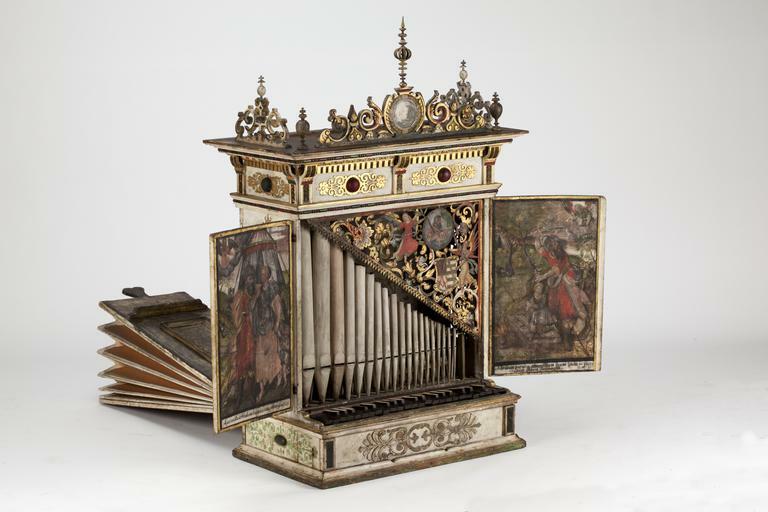 It would be set on a table, and the player would press the keys while an assistant pumped the bellows from the back in order to produce the sound. 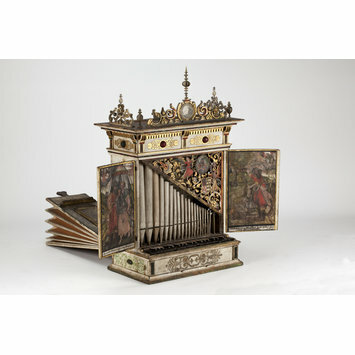 This instrument may have belonged to Johann Georg I Duke of Saxony (1585-1656), whose portrait is painted on the instrument. The crest of the organ is decorated with openwork scrolls, known as 'strapwork', a style popular throughout Northern Europe during the Duke's lifetime. The wooden case of the instrument and the open-work ornament above the cornice are carved, painted and gilt in renaissance style. The leather pipe shade is painted in tempera with designs with designs which include angels, and the arms and a medallion-portrait of Johann Georg I, Duke of Saxony (1585-1656). The painted design is outlined by the cutting away of the leather background. On the insides of the two shutters of the case are painted in tempera the Dismissal of Hagar and the Sacrifice of Abraham. All the pipes are made of hard, thick paper, and are glued into their footholes. Blowing was originally effected from the rear by means of feeders (now missing). "Erbaut 1741 Tobias Defrain Orgelbauer a Dresden". Built in 1741 by Tobias Defrain, Organ builder in Dresden. DG. IOAN. GEOR. D. SAX. ML. CL. & MON. ELEC. Abraham Parentus offeret fillium suum Isaac in Sacrificium domini. Abraham, as a parent, will offer his son Isaac as a sacrifice to the Lord. Inscribed DG. IOAN. GEOR. D. SAX. ML. CL. & MON. ELEC, with a portrait of Johann Georg I of Saxony. Inside the shutters are painted the stories of The Dismissal of Hagar and The Sacrifice of Isaac. The case is of pine and the keys, slides and windchest are of birch. The three ranks of pipes are made of layered paper. The instrument's range is forty-one notes, C/E - g2, a2. Gottfried Fritzsche was organ builder to Johann Georg I, Elector of Saxony during the 1620s, and worked extensively in Hamburg during the 1630s. It is thought that the pipes were originally of lead. 'The organ has long been believed to be the work of Gottfried Fritzsche (1578 - 1638), organ builder to the Electoral Court of Saxony ... During restoration of the case work in 1967, a faint pencilled inscription was found on the key-frame, reading: "Erbaut 1741 Tobias Defrain Orgelbauer a Dresden". This doubtless refers to a renovation of the instrument rather than to its initial construction. The organ's compass and the portrait of Duke Johann Georg I (1585 - 1656), who reigned from 1611, all confirn its seventeenth century origin. The specific date 1627, traditionally associated with this organ and given in previous catalogues, is therefore not improbable. It cannot, however, be substantiated at present.' - Howard Schott.